Center for Council serves thousands locally and globally through a variety of grant-funded programming. Our Council-based programming is designed to foster positive culture in a variety of professional, business and organizational settings. Center for Council programs increase individual wellness, deepen cooperation and interpersonal relationships, and lead to a more resilient and generative organizational culture. All our programs are structured in a “train-the-trainer” format, creating a "ripple effect." Participants learn the skills and pedagogy of Council practice, equipping them with the tools they need to facilitate Council circles for their peers and to become agents of change within their own communities and organizations. Public Workshops are available to individuals interested in learning the practice of Council and exploring its use in their lives and work. These 16-hour workshops typically span 2-days and are scheduled throughout the year in a variety of venues. Learn more about Public Council Workshops. Professional Trainings, customized for organizations, businesses, and other entities, are offered to enhance communication and leadership skills and to support team building, creative problem solving, resilience, and other objectives. Please contact our team to inquire about creating a customized Professional Training for your group. Learn more about customized Professional Trainings. 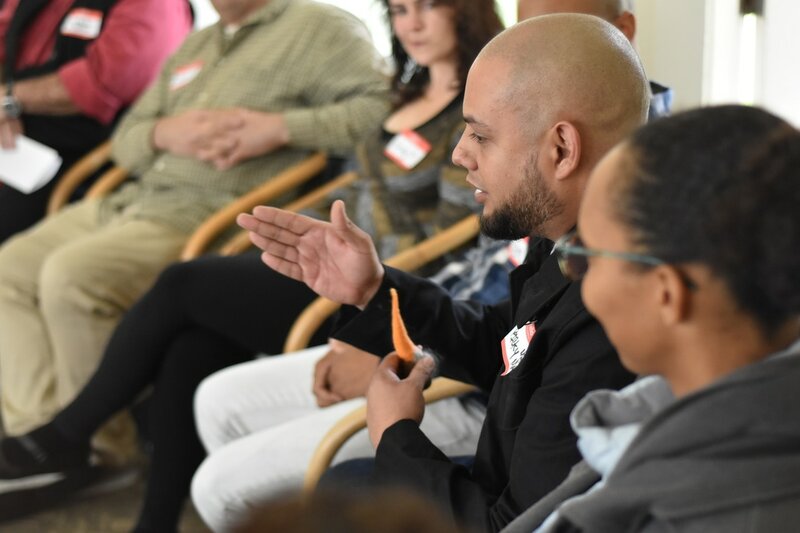 Through the Inmate Council Program, inmates both learn and teach Council-based convening, communication, and conflict-exploration skills that support healthy and productive perspectives and behaviors. Learn more. The Organizational Wellness Project provides staff at select community based organizations with Council training, resources, and consultation to more effectively engage with constituents and to provide quality support, while also helping foster more cooperative and supportive work environments. Learn more. Center for Council has tailored programs to fit the needs and budgets of nearly any organization, anywhere in the world. Center for Council serves as a resource to a wide variety of initiatives and convenings, locally and around the world, in sites ranging from Kigali to Krakow, Paris to Pine Ridge. Through training, mentoring and consultation, Center for Council supports individuals, organizations and communities in bearing witness, finding common ground, repairing harm, and building trust. Learn more. Watch the video below to see how the programs of Center for Council are truly transformative to those engaged in the practice of convening Council circles.